The mitral valve is shown in the same patient with Marfan's syndrome. The leaftlets of the mitral valve are redundant, and the one on the far left is ballooned upward. 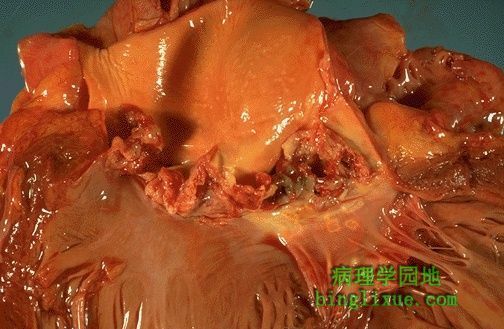 This is characteristic of floppy mitral valve with mitral valve prolapse. The chordae tendineae that hold the leaflets become long and thin. The characteristic finding on physical exam is a mid-systolic click. This view of the mitral valve in a patient with Marfan's syndrome depicts a floppy mitral valve. The leaflet on the lower left has ballooned upward and the prolapse has resulted in contusion of the top of the leaflet, with a red black area of discoloration. 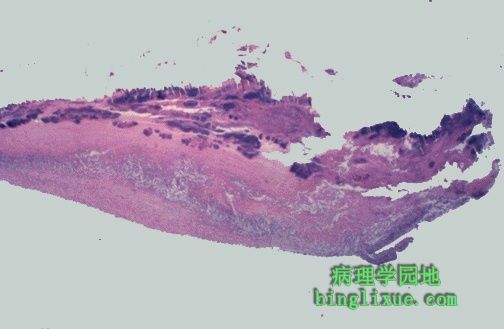 This mucin stain of the wall of the aorta demonstrates cystic medial necrosis, typical for Marfan's syndrome and causes the connective tissue weakness that explains the aortic dissection. Pink elastic fibers, instead of running in parallel arrays, are disrupted by pools of blue mucinous ground substance. 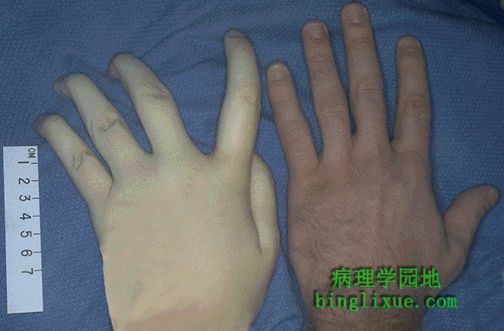 The hand at the left is that of a young woman with Marfan's syndrome, while the hand at the right is a normal male. Both persons were of the same height, 188 cm. However, note that the hand at the left demonstrates arachnodactyly. 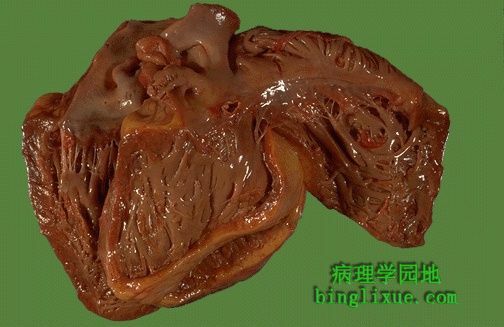 This is infective endocarditis. 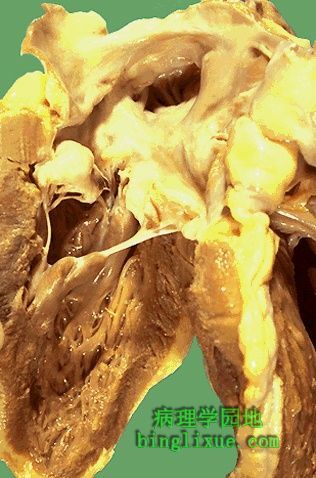 The aortic valve demonstrates a large, irregular, reddish tan vegetation.Virulent organisms, such as Staphylococcus aureus, produce an "acute" bacterial endocarditis, while some organisms such as Streptococcus viridans produce a "subacute" bacterial endocarditis. The more virulent bacteria causing the acute bacterial form of infective endocarditis can lead to serious destruction, as shown here in the aortic valve. Irregular reddish tan vegetations overlie valve cusps that are being destroyed. Portions of the vegetation can break off and become septic emboli. In this case, the infective endocarditis demonstrates how the infection tends to spread from the valve surface. 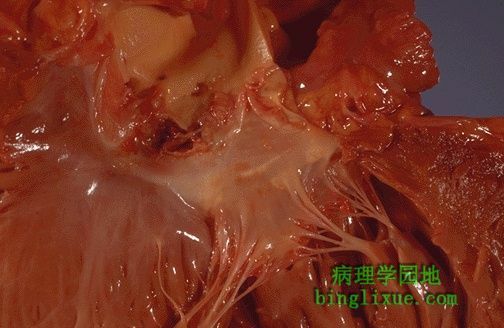 Here, vegetations can be seen on the endocardial surfaces, and the infection is extending into to underlying myocardium. 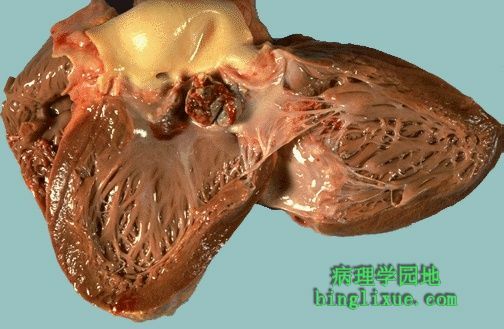 Here, infective endocarditis on the mitral valve has spread into the septum all the way to the tricuspid valve, producing a fistula. 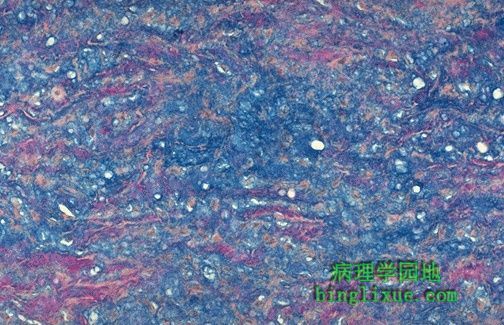 Microscopically, the valve in infective endocarditis demonstrates friable vegetations of fibrin and platelets (pink) mixed with inflammatory cells and bacterial colonies (blue). The friability explains how portions of the vegetation can break off and embolize.